This waterfall creates a nice spray-cliff community on the rocks and pours into a flat pool at the bottom. From Asheville, follow I-26 west (US 19/23 north) for about 8 miles to Weaverville. Take exit 19 for US 25/70 west toward Hot Springs and go 21.3 miles. US 25/70 splits left at the Big Laurel River right after a very curvy stretch of road; continue straight, onto NC Hwy. 208 and go 3.4 miles to NC Hwy. 212. Turn right; gravel Hickey Fork Road is on the left after 6.8 miles. Turn left and go 1.1 miles (the road turns to FS 465 once it crosses the National Forest boundary) to the parking area just before the gate. 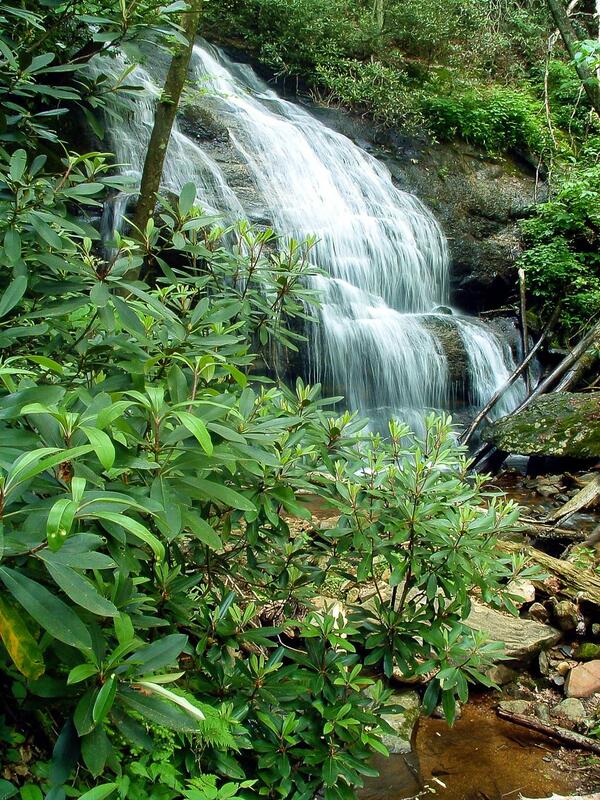 This hike takes you on a portion of the Hickey Fork trail. Starting just up the road from the parking area, you'll descend to a long log bridge over the main stem of Hickey Fork Creek. This bridge has been washed out in the past, but was in good shape last time I visited. The trail then winds around the flats on the other side of the creek a bit, heading upstream, before climbing gently up the ridge and over into the West Prong valley through a forest of dead hemlock. Then you'll cross some small tributaries and then the West Prong on stepping stones. It should be a dry crossing, but you may find your feet wet if the water is really high. The trail then meanders through a level area, going upstream, before beginning to climb the side hill. A couple of small tributary branches are crossed here and the gentle ascent gives way to a steady climb. At one point, a large rock juts out over the valley just to the right of the trail. Just past that, the trail joins with and follows a tributary seep/stream uphill for a few feet - look for log steps where it emerges. Hickey Fork comes back to meet you at the top of a very long, shallow slide right beside the trail. The trail then climbs away from the creek again, before passing the main waterfall. A steep, slippery side path leads to the base of the falls.